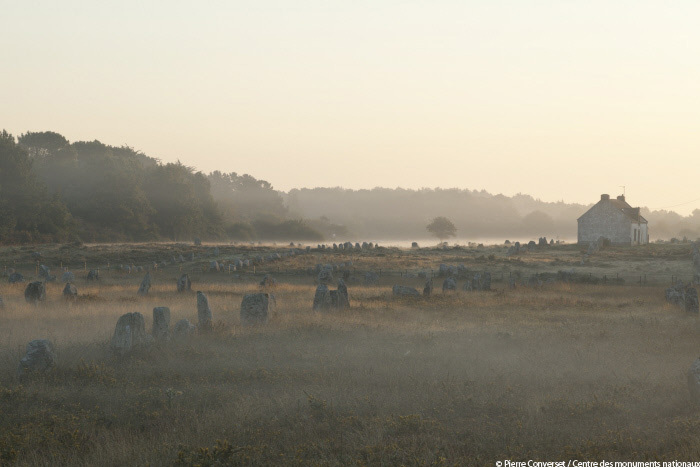 Dating from the Neolithic period, the stones in Carnac, organised in complex arrangements across a vast and carefully chosen area, have yet to give up all their secrets. With no apparent link to the stars, the sun or the moon, these fascinating groups of stones, listed as Historic Monuments in the late 19th century, are today believed to be the remains of structures built in connection with funerary monuments still visible at the fringes of or within the rows of stones themselves. Considered "fields of remembrance" serving to mark a border, as much physical as mental, the Carnac Alignments continue to pose an archaeological conundrum for scientists. The idea of a temple in ruins, which emerged in the 19th century, has been gradually rejected. A fresh proposition suggested it was a site of "passage", a threshold, marking the gateway between two spaces, two worlds. In fact, exploring the intimate relationship that these monuments have with their immediate environment has proven to be an extraordinary line of research that, very rapidly, revealed a mind-boggling affinity between each of the three main stone groups in Carnac: the repetition of a general arrangement no doubt suggests a deliberate intention to convey the same message. Just under 35,000 cubic metres of materials expertly arranged since the beginning of the fifth millennium B.C. form the artificial hill on which a chapel dedicated to Archangel Michael stands. This monumental funerary structure intended for an important figure of the time is a spectacular embodiment of remarkable technical skills, the fine achievement of the builders’ motivations and proof a social hierarchy evidenced by the quality of the objects found within the tomb. In fact, the Tumulus of St. Michael, excavated by archaeologists in the second half of the 19th century and again at the turn of the 20th century, was certainly a burial place of gigantic proportions originally designed for one person, housing a collection of prestigious objects. The raw materials from which these objects are crafted (Italian jadeite, for example), combined with their fine polishing, are a testament to the particularly high social standing of the deceased. The location chosen for the burial place, the highest point in the region, is another factor that contributes to the site's prominence. Visible from all around, the monument, restored by the Centre des Monuments Nationaux, affords visitors a unique panorama once they have made it to the summit. Some ten monuments around the alignments are less well-known and sometimes hard to get to, but some deserve closer attention by the public – the Tumulus of Le Moustoir, Crucuny and others.